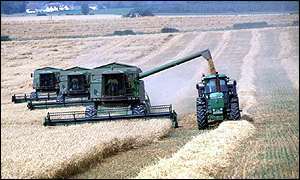 The farming industry in the north of England is in danger of being wiped out, according to a government adviser. Sir Donald Curry, chair of the Meat and Livestock Commission, says farmers are disillusioned and leaving the industry "in droves". Sir Donald, a former Tynedale farmer and National Farmers' Union (NFU) official, says more government help is needed to attract younger people into farming. He is addressing a major conference on the future of farming, to be attended by Environment Secretary Margaret Beckett. Sir Donald said the average salary of farmers in the North East has dropped to below �10,000 a year. He warned that if more young people could not be tempted into farming, the future of the industry in the region would be seriously jeopardised. Sir Donald said: "Farming has gone through such a dire period and farmers are feeling very disillusioned and are lacking in confidence. "Now the government has got to do its part and so have the food manufacturers and retailers." The Curry Commission report, published in 2002, recommended a shift in policy to make farms less dependent on subsidies and more responsive to the demands of consumers. It suggested diverting money earmarked for the European Union's controversial Common Agricultural Policy (CAP) into "green" schemes instead. But Sir Donald warned: "Young people do not see the farming industry as an attractive career. "Many farming families across the north have seen their sons and daughters leave the industry. "We have to try and make an industry that generates profit or else young people will not be attracted back. "This is a fundamental problem which I highlighted in the report I submitted to the government." The government says it wants farmers to become more enterprising and environmentally friendly. In July 2002, Chancellor Gordon Brown announced �400m earmarked for efforts to promote sustainable farming. "Young people don't see farming as a profitable career"